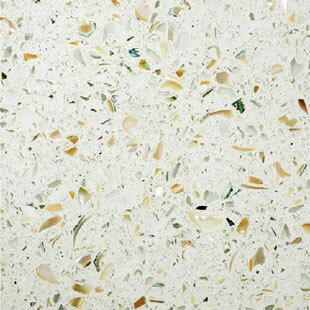 Quartz tops are a man made slab consisting of crushed quartz stone bound in a resin. They are very strong and durable. They are, generally speaking, more costly than natural stone tops. One of the reasons for this is that slabs of quartz are produced in smaller sizes than natural stone. Therefore it can take more slabs to produce a set of countertops depending on the layout of the kitchen. Why don't the manufacturers just make the slabs bigger you ask? The quartz slabs are produced by heating the quartz/resin mixture and larger slabs start to warp during this process. Quartz tops offer more uniform patterns than most natural stones, and some very interesting color choices for creative designs. 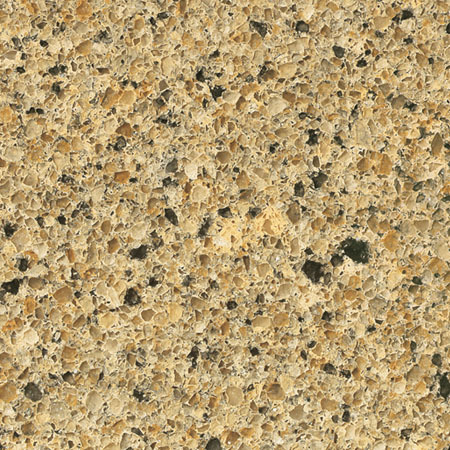 Here is a close-up of a Cambria quartz. In addition to quartz tops there are some other countertop materials that I call the "cousins" of quartz tops, mostly because they are produced in a similar process. 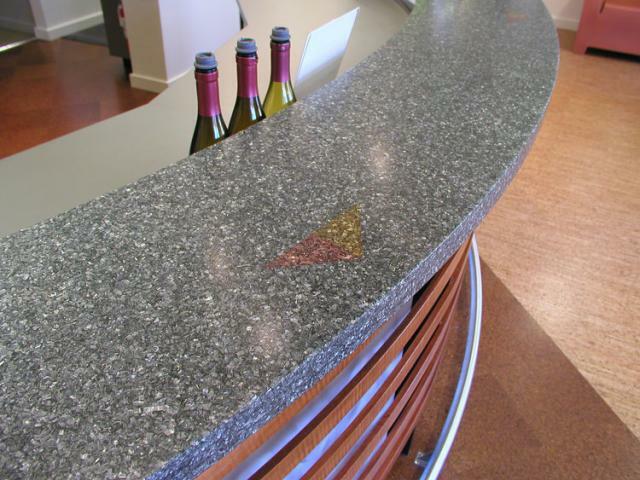 One such material is IceStone which is made from post consumer recycled concrete and glass. 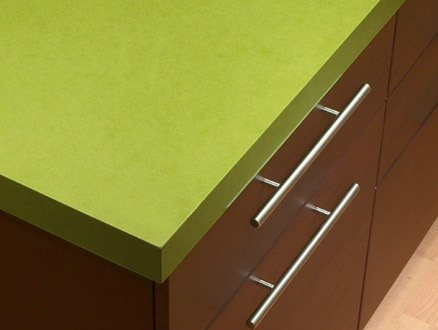 These tops tend to be even more expensive than quartz tops and while they can have a similar look some colors are quite unique. Other companies utilize recycled glass in different binders as well. The "slivery" shapes of the crushed glass give the IceStone tops a unique look. Manufacturers are also binding other materials in clear resin. 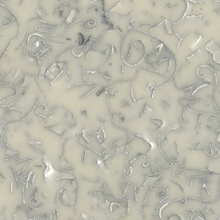 Alkemi offers different colors of aluminum scraps bound in a clear and opaque resins. The effect is really cool. In Part III we'll be discussing paper countertops. Yes, I said paper!